The Martin House Farm is an 18th and early 19th century shingled farmhouse. 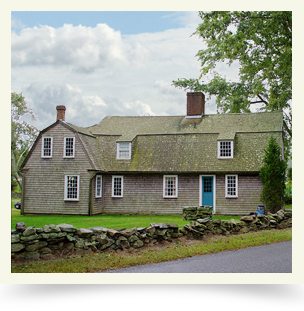 The original house, a one-room dwelling with loft, was built by John Martin, Jr. between 1715-1734. In 1814 the house was enlarged to eight rooms with a gambrel roof and center chimney. A late 19th century ell completes the present building. The property remained in the Martin family until given to the Massachusetts Society in 1930. From I-95, use exit 2 in Massachusetts, marked “Warren-Newport” Bear right on ramp and turn left at light onto Route 6. Martin House is 1/2 mile east on Route 6 at Stoney Hill Road.